I started out the morning tack cleaning. One bridle, two bits (a nathe for dressage and a french link for xc, don’t hate me because I overbit, lol), a breastplate and two saddles. I caught myself thinking about how many horse trials, foxhunts and training rides I had done in my jumping saddle and I was thinking that I probably should start thinking about buying a new one. At any rate, two hours later the saddles were fabulously clean and packed in the trailer. Then it was on to boots. I wear gloves when I polish my boots because there really is notneed to have black fingers for several days when it can be simply avoided. But today I learned that the latex gloves have powder on them, which leaves really quite unacceptable ghostly white prints on shiny boots. So latex, no bueno. 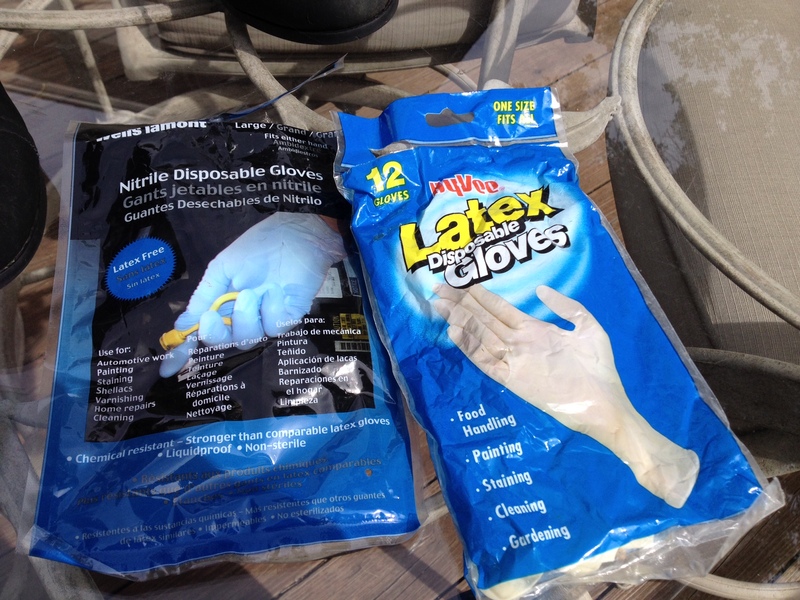 The nitrile ones on the left are a big yes. I polished my competition boots and shined up a pair of paddocks and half chaps for riding the day before competition. Doing it this way saves some boot cleaning at the show. 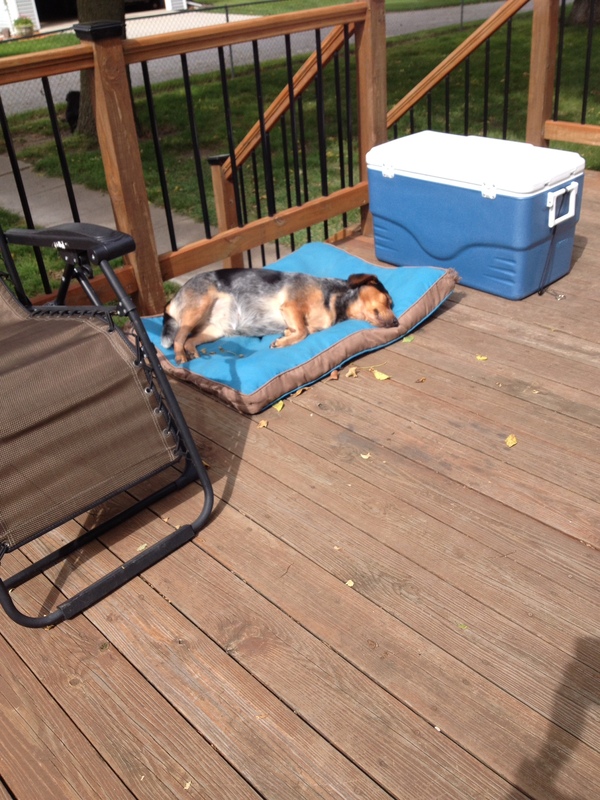 Dug was very impressed with all my cleaning and cheered me on from her dog bed. I continued with packing until the back tack of the trailer was stuffed . One time I ran out of hay at a show and there is nothing worse than the guilt associated with Mother Hubbard’s cupboard being empty at a show. Friends baled me out (oh, I’m so punny), but I may now be quite reasonably accused of being a hay overpacker. There might be a support group for me somewhere, but by golly, Eddie will have enough hay this weekend. Then, since we are leaving in the wee hours of the morning tomorrow, I lay down on the couch for a nap. I was just getting up when Jay said, “Your lesson is here.” “No it isn’t, I don’t have a lesson to teach until 4.” So I get up and go look and it is a vehicle I don’t recognize. 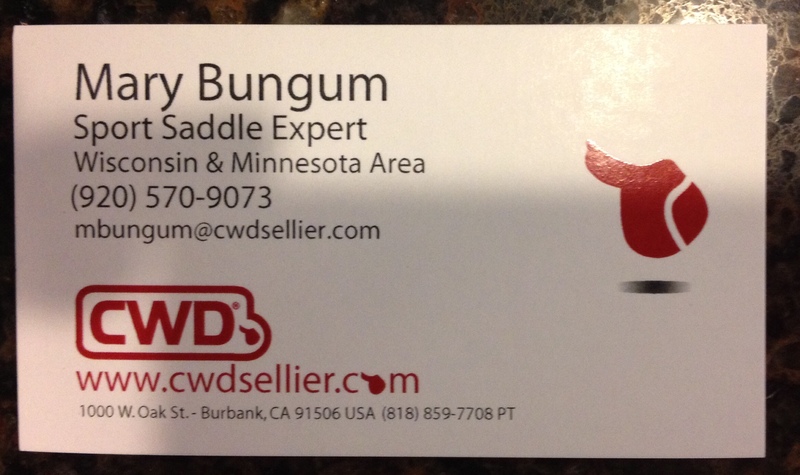 Turns out it is a new saddle rep for CWD saddles. If I appeared a little bemused when she told me who she was and why she was there, it was because of my thought in the morning about “probably time for a new saddle” and then her appearing, unsolicited, in my driveway with, what ho, a bunch of new saddles. Usually my intentions don’t work that fast. We got to talking and it turns out she went to school with my nieces at St. Mary’s of the Woods in Indiana. She took a look at my existing saddles and was actually very complimentary about how they fit, with a few minor exceptions. As long as she was here, I tried one of her jumping saddles on Eddie. It fit him beautifully and had balance as good as my Berney (and that is saying something) and was more supportive in the seat. (Loves me a Berney, but they are a little short on ANY sort of padding in the seat). The CWD has the bases covered in quality and utilitarianism and it was comfortable to boot. What? Crazy talk! I jumped a few jumps in it and galloped a bit and it felt great. So I asked her if I could test ride the saddle for the weekend at the ATCs and she agreed. So, it is going to TX with us. This particular saddle is just a hair small for me, but acceptable. Amazing really, that she had something on hand that would fit me and Eddie. I will very probably show jump in it and may run xc in it. We’ll see. I hacked in it on another horse late in the day and it still felt good.